To succeed, these strategies depend upon secure land rights for indigenous and traditional communities, resolution of land disputes, effective land management, and follow through on commitments to no-deforestation and low-carbon agricultural practices. The report also highlights significant gaps in our understanding and recommends areas for future research. This report is accompanied by several supporting documents with extensive information on the Cerrado biome. To complement the findings of this report, reviews were solicited from issue experts. 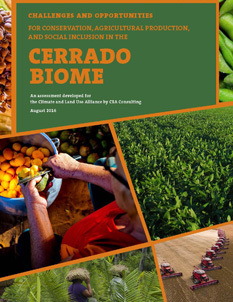 These reviews present a diversity of perspectives on priorities in the Cerrado and pose a number of fundamental questions about how to approach interventions in the region. Dickie, A., Magno, I., Giampietro, J., Dolginow, A. 2016. 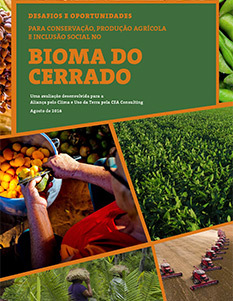 “Challenges and Opportunities for Conservation, Agricultural Production, and Social Inclusion in the Cerrado Biome.” CEA Consulting. The tropical savannas that span the center of Brazil are among the largest, most biologically diverse in the world. Known as the ‘Cerrado’, this biome supports an array of fauna and flora, almost half of which is found nowhere else on earth. It is also home to a culturally rich and diverse group of indigenous peoples and traditional communities. And the Cerrado is a critical source of freshwater, and an essential region for Brazil’s food and water security. Since the 1970s, large-scale agriculture has advanced across the region, contributing to Brazil’s emergence as one of the top global producers of agricultural commodities. With the expansion of industrial agriculture, more than half of the Cerrado’s original vegetation has been lost. Yet the biome remains one of the least protected in Brazil, with less than 3% within legally-designated conservation areas. Brazil’s Intended Nationally Determined Contribution (INDC), now part of the Paris Agreement from COP21, makes no mention of the Cerrado, despite the growing rate of deforestation there. 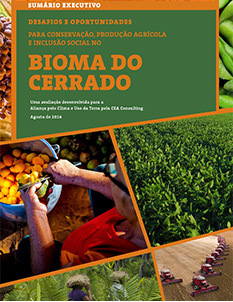 Paradoxically, a successful moratorium on new deforestation for soy production in the Brazilian Amazon – in place since 2006 and recently extended indefinitely – also seems to have accelerated the expansion of the soy frontier into the far more threatened Cerrado biome. The northern expanse of the biome is known as Matopiba, because it comprises portions of the states of Maranhao, Tocantins, Piau, and Bahia. It contains the last remaining large intact expanse of native Cerrado, and on that basis should be at the center of regional conservation efforts. But it is also the leading edge of the expansion of industrial agriculture. Two thirds of annual deforestation in the Cerrado over the past six years has taken place in this region. Current and proposed development pose a serious threat that could jeopardize the lands and livelihoods of the region’s indigenous peoples and traditional communities, including afro-descendant quilombola populations with unique cultural heritage. This report focuses on Matopiba and the host of economic, social, and environmental issues that have been brought sharply into focus there.